By the last week of March, Nome’s temperature normally remains above zero at night--just barely--and the daytime highs are up into the teens. Let’s hope this is a “normal” March and we begin enjoying that warmth! Thank you for the kindness of your contributions, and for the goodness of your prayers, which keep our mission on the air. The month of March is our most hectic, as many of us work 80 to 100 hours a week, bringing award-winning coverage of the Iditarod Race to our listeners. Before this incredible event, this used to be western Alaska’s “suicide month.” Nobody knows why, though the great swing in sunlight, from 4 hours to 13 hours in three months, may be involved. Today, the Iditarod provides a marvelous distraction, and as people strain from great distances to pick up our race coverage, they hear all of our usual high quality fare: inspirational and educational spots, news, information, companionship and the discussion of many important issues. top Father Mark Hoelsken, SJ visits with volunteer news reporter Jodi Engle. KNOM’s spiritual director, Father Mark spends most of his time ministering to three remote villages about 300 miles to the south. While here, he recorded spots, tended to letters, and conducted a retreat for the volunteers. INSPIRATIONAL SPOT: He who loses money, loses much. He who loses a friend, loses more. He who loses faith, loses everything. BIG BOOST: A perfect test village for our antenna booster project is Shishmaref (pron. SHISH-mah-reff). Although it’s almost next door, only 130 miles away, a range of 4,000-foot mountains blocks our signal in that direction. While KNOM could be heard 15 years ago, gradually, local power line static drowned us out. Last month, we distributed 40 Select-A-Tenna boosters to Shishmaref (that’s about 49% of the households in the village), and they have deluged us with thanks. A DUB, DUB: It’s finished! Thanks to the generosity of many of KNOM’s friends, Les Brown has finished wiring the upstairs dubbing station, a mini-studio for editing and recording tapes in the back end of our computer room. The fans inside the room’s seven computers make the room noisy, and three-inch foam baffles glued to the walls help reduce the clatter. Using the old newsroom console and new professional-grade cassette and CD machines, the room will see heavy use, taking pressure off the fully equipped studios downstairs. We’ll feature a photo of the finished dubbing station next month. Thank you! 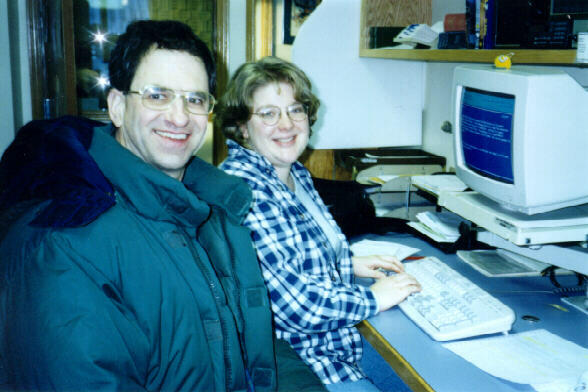 www.knom.org is KNOM’s web site, which is maintained free of charge by former KNOM’er Tom Bunger, including the past two years’ Nome Statics, with pictures in color. A glitch with our Internet provider caused the web site to disappear for a few days in February, but we should be back on! INSPIRATIONAL SPOT: The will of our God and Father must be obeyed, even to our last breath. Perfection comes from conforming our will, not to this world, but to our Father’s world. top TRAILING: (left) For the 3rd time, KNOM news director Paul Korchin will bundle up for the cold. By the time you read this, he’ll be flying along the Iditarod Trail, sending a dozen musher interviews a day to keep KNOM listeners informed of the progress of the great race. It’s grueling, often uncomfortable and sleepless work in some of Alaska’s most remote spots. Back in Nome, Tom Busch feeds Paul’s material and his own analysis and commentary to the Associated Press, which helps subsidize the cost of our Iditarod coverage. INSPIRATIONAL SPOT: When life is going well, it’s easy to think our successes are because of something we’ve done. But what happens when things aren’t going that great? We can become discouraged, even blame others for our troubles. top Among topics discussed on KNOM interviews so far during 1999: juvenile delinquency, bilingual education, wilderness firefighting, employment, bush aviation, domestic violence, alcohol recovery, economic development, eroding shoreline, loss of fish, bush education, and many more. Thank you for helping us bring our listeners together to discuss subjects which are vitally important to them. INSPIRATIONAL SPOT: Teachers and scientists use beaded models to help us understand atomic theory and our cells’ DNA, the building blocks of our natural world. The Blessed Virgin Mary gave us her Rosary beads to help us understand our faith, and Our Lord’s world. top Volunteer KEVIN GLYNN poses in our upstairs dubbing station, a week before it was completed in early February. Thank you to everyone who contributed to this mini-studio! Kevin left KNOM two weeks later, to return to the Lower 48. We’ll miss him, but know that he will fare well. While his stay in Nome was short, it was filled with hard work. Among his other accomplishments at KNOM, Kevin transcribed hundreds of hours of taped Eskimo stories and legends onto paper, so that the traditional tales, now on worn-out tapes, can be revoiced and preserved into the future. We know that you join us in wishing this outstanding young man every success. Thank you, Kevin! INSPIRATIONAL SPOT: The Iditarod trailbreakers work long and hard in the long, cold, dark Alaskan winter to build ice bridges across the most dangerous stretches of trail. For some mushers, hitting that ice bridge just right can be the difference between winning and losing, sometimes between life and death. God is building bridges of love and grace for us in the darkest, coldest, most dangerous times of our lives. But unlike the ice bridges, all we have to do is take one step to safety. And God’s bridge does not melt when things heat up. 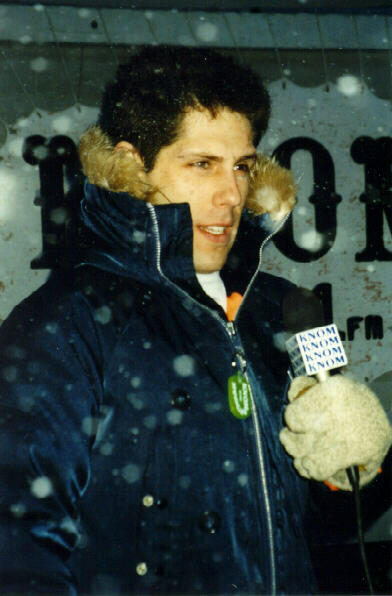 top 25 YEARS AGO: In March 1974, KNOM volunteer Steve Havilland became the station’s first Iditarod trail reporter, following the 1,049-mile race by small airplane. 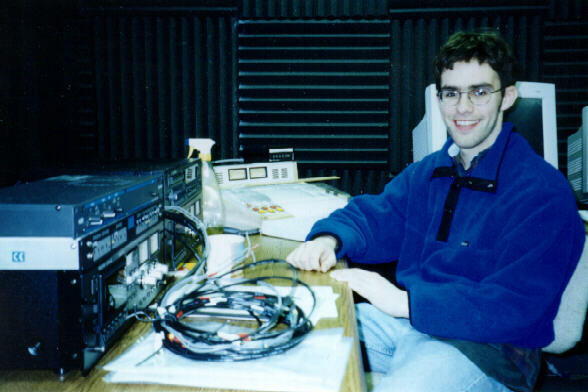 KNOM had covered the first Iditarod Race the previous year by shortwave radio. Meanwhile, Nome Static Transmission 86 pleaded for new volunteers, realizing that the coming September was going to bring a complete staff turnover. 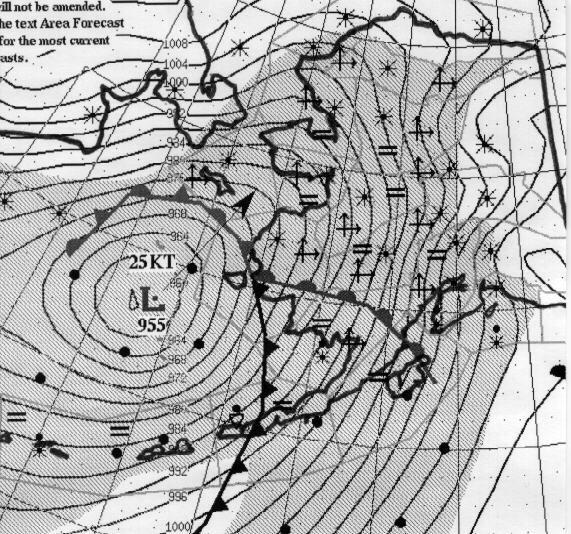 32 YEARS AGO: According to “Nome Static” Transmission 4 in the spring of 1967, a series of snowstorms shut down Nome every four days. Snow drifted above the rooftops of many houses. For daily Mass, worshippers ducked through an eight-foot long tunnel of snow to the parish’s small chapel. 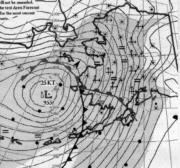 GOD’S THUMBPRINT: The Weather Service called it the worst winter storm in 25 years, as warm North Pacific air invaded the Bering Sea, raking an immense region with heavy snow and winds estimated at 100 MPH in places. The brutal winds shut down everything for hundreds of miles and left Nome with drifts above some rooftops. The area covered by this weather map is approximately equal to the entire United States east of Omaha. The center arrow, indicating storm movement, points almost directly to Nome. -30’s, a week later, into the -40’s. Some of the villages we serve approached -70 Brrr!. INSPIRATIONAL SPOT: If God seems distant to you...who moved? top A PLEDGE TO YOU: As we have since the very first “Nome Static” in 1966, we promise that we will never provide your name and address to anyone. MISSION STATEMENT: KNOM is on the air to inspire, to minister, to educate, to inform, and to be a companion to the thousands of Eskimo, Athapascan Indian and Aleut people who live in western Alaska’s remote villages. None of these isolated points is accessible by road, and some see a priest or another religious or Catholic lay worker only occasionally. In addition to providing the Holy Mass, the daily Rosary and other spiritual programming, we also seek to reach the unchurched. Our broadcasts actively support the many organizations which work hard to reduce this region’s staggering alcohol abuse, suicides, domestic violence, health problems such as hepatitis and tuberculosis, and dire poverty. THANK YOU again for your generosity to the scattered people whom our mission serves. We would not exist without your continual support. May God bless you for your kindness.